The Western media have ignored the fate of the Kurds, the people who defeated ISIS for us. UK Foreign Secretary Boris Johnson tweeted, "Turkey is right to want to keep its borders secure". The West gave the Turks a green light to massacre the Kurds. The Kurds today, like the Czechs in 1938, were sacrificed in vain. The West has betrayed the Kurds three times in the last three years. They were our ideal allies. They opened their cities, such as Erbil, to tens of thousands of Iraqi Christians expelled by ISIS from Mosul. Iraqi Kurdistan is today the only place in the Middle East, along with the State of Israel, that harbors and protects all religions and minorities. A new "Munich Syndrome" is now looming over the West. The Kurds, if they did not deserve a state, were at least worthy of our protection, especially after helping us to stop those who slit our throats on the boulevards of Paris. The Kurds have a proverb: "We have no friends but the mountains". In Afrin, however, even the mountains could not protect them from the Turkish warplanes and the Islamist militias allied with Ankara. Although the videos of terrifying executions are certainly not new in the tragic war of Syria, in this instance the video was shot by a terror group operating under the command of a NATO country, Turkey. The video shows members of Syrian militias abusing the corpse of Amina Omar, a female Kurdish fighter who was also known as "Barin Kobani". She was killed defending Afrin, a city-canton in Syria attacked by the Turkish army of Recep Tayyip Erdogan. In the video, Omar, who belonged to the female unit of Kurdish People's Protection Units (YPG), is called "female pig" and a soldier steps on her breast. The desecration of her corpse ended up symbolizing not only the ferocity of the Kurds' enemies, but also the sense of a huge, unbearable moral and political betrayal suffered by the Kurds at the hands of their Western allies. "Shame: the West is turning a blind eye to the fate of the Kurds" wrote Ivan Rioufol in France's Le Figaro. "They fought alongside us in the war against ISIS. Erdogan labels as 'terrorist' this small people arming women, who have their hair in the wind and leave religion in the private sphere". "My sister, Barin, had fought alongside the coalition in Raqqa against the Islamic State and in many other places too", Omar's brother told The Times from the city of Kobane. "How can there be justice or trust between allies when the coalition put their own benefit above morality and allowed Turkey to attack us, and with Nato weapons?" There has been a "deafening silence" from most Western leaders about the Kurds suffering an illegal Turkish invasion, said Sandeep Gopalan, a law professor at Deakin University in Melbourne. The European chancelleries all abandoned the Kurds to their fate. Just think, UK Foreign Secretary Boris Johnson tweeted, "Turkey is right to want to keep its borders secure". The West gave the Turks a green light to massacre the Kurds. "the Turkish attack on Afrin was entirely unprovoked. In fact, Afrin was so peaceful for most of the Syrian war that it became a safe haven for tens of thousands of refugees — some of whom are now refugees for a second time. In the cantons they controlled, the Kurdish-led forces had established an oasis, unique in Syria, of local self-government, women's rights, and secular rule". The battle of Afrin was a horrendous defeat for the Kurds in Syria, one with appalling consequences. At least 820 Kurdish fighters were killed in action. Many other deaths have yet to be confirmed. 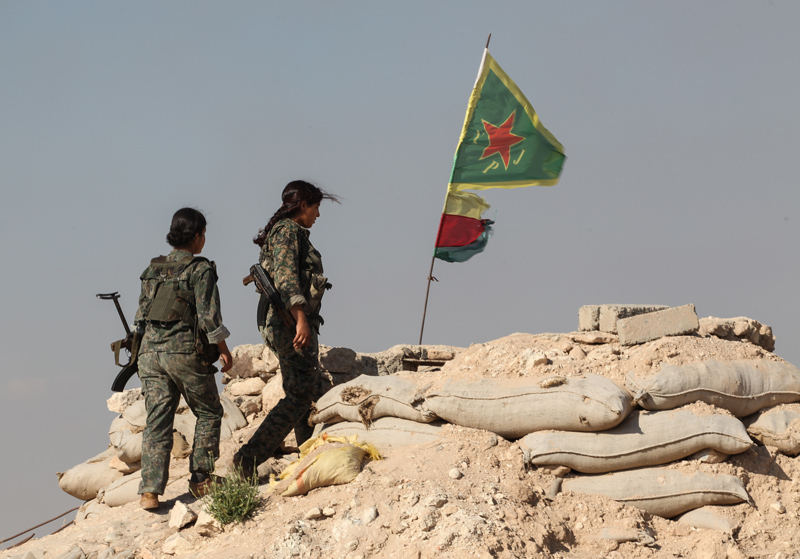 By comparison, 660 Kurds were killed fighting under the insignia of Syrian democratic forces, supported by the United States, in the battle to free Raqqa, the de facto Syrian capital of the ISIS Caliphate. "Two days before ceding the Sudetenland to Nazi Germany in Munich in September 1938, British prime minister Neville Chamberlain dismissed the issue as 'a quarrel in a faraway country between people of whom we know nothing'. Pretty much the same can be said of the attitude of the West towards Turkey's attack on the Kurdish enclave of Afrin in northwestern Syria". In the early hours of Sept. 30, 1938, Great Britain, France and Italy allowed the Nazis to annex the Sudetenland, a region of Czechoslovakia. The Czechoslovakian government opposed and resisted, but its Western allies, determined to avoid war "at all costs", were willing to negotiate with Adolf Hitler. The Munich Agreement, however, did not bring peace to Europe; it brought war. Just as the Czechs were sacrificed in vain, the West has betrayed the Kurds three times in the last three years. The first time in Kobane, the besieged Kurdish city at the border with Turkey, where, in a battle that only "revealed the West's helplessness in the face of radical jihad", the inhabitants fought to escape a certain death under ISIS. After Kobane, the Kurds were abandoned during their referendum for independence from Iraq last September. Now they have been betrayed in Afrin, the Syrian canton where many minorities of the Syrian war took refuge. When, at the end of 2014, Westerners decided to intervene directly to get rid of the ISIS Caliphate, they encountered an obvious problem. How could the West defeat the Islamists as we are no longer willing to risk our troops and lives on the ground? Through the Kurds. It was the Kurdish forces who gave first aid to those Yazidis fleeing the genocide waged against them by ISIS. Thousands of Yazidis ended up in mass graves or captured and put into sexual slavery. That is when Germany started to send weapons to the Kurds. Now the Yazidis in Afrin are suffering yet a new wave of persecution by the Turkish allies. "The tragedy that the Kurds are experiencing is the sign of an unprecedented weakening of the West. Is it the equivalent of the battle of Adrianople, which precedes the fall of Rome? I hope not. But the resignation has been such a great disgrace... one of those seemingly aberrant micro-events that signal a change in the world. This is not the first time that the West has disappointed its allies or sister nations. It was the case during the rise of Nazism. Then, with the abandonment of half of Europe to communism". The Kurds were our ideal allies. They opened their cities, such as Erbil, to tens of thousands of Iraqi Christians expelled by ISIS from Mosul. Iraqi Kurdistan is today the only place in the Middle East, along with the State of Israel, that harbors and protects all religions and minorities. According to the former European parliamentarian Paulo Casaca, the Kurdish regional government has shown the utmost respect for all minorities that have been widely persecuted in other areas of Iraq. "Abandoning them would be an unforgivable moral error. The Kurds of Syria defeated the Islamists who have caused the worst attacks in our history. The Turkish-Islamist atrocities in Afrin do not promise anything good. When young Kurdish fighters with admirable courage are captured by the jihadists, they are tortured, gutted and cut into pieces. This barbarism is unsustainable. The Kurds are also our only allies in the region and have demonstrated their effectiveness in the field. If we abandon them, there will be no one to help us contain new terrorist explosions against us. Finally, the Kurds of Syria are building a democratic society that respects ethnic and confessional pluralism and equality between men and women. This will have a profound influence in a region torn apart by tyranny".